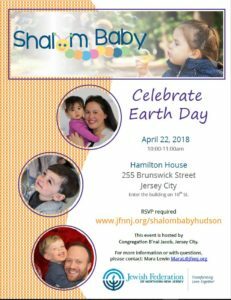 A Shalom Baby playgroup is not a big event like Shalom Sesame. It is a more intimate experience geared to babies, toddlers and young siblings. Parents, grandparents or caretakers are welcome. The structure of the playgroup includes; free play, crafts, a story, songs and creative movement set to live guitar. The theme of Earth Day was chosen since April 22nd is Earth Day and will talk about Baal Tashchit. RSVP is required. Numbers will be limited to ensure an intimate experience for the children.